Sometimes the simplest things have the most powerful impact. Building a walk-in shower with no door gives your bathroom a startling and modern lift that is hard to create any other way. Although a doorless walk-in is most easily suited to a large bathroom, careful planning lets you include the experience in a small room. Aim for simplicity and enjoy the relaxing and stimulating experience of a doorless shower. 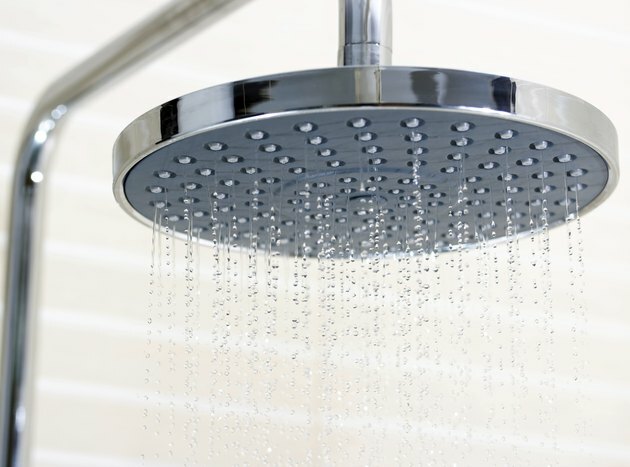 Builders recommend that you allow 6 to 7 feet of space on every side of the showerhead for a completely open shower. Without walls, doors or curbing to contain water, space offers the best way to keep shower splashes from soaking the whole floor or other fixtures. If your shower space is smaller, a curb, half-wall or translucent partition wall provide the freedom of a doorless shower while keeping water within its bounds. Create good drainage by gently sloping the shower floor toward the drain. Choose a non-skid tile flooring to reduce slipping hazards. A generous-sized drain keeps water from puddling. Pair good drainage with a low curb or step-down for even safer results. A doorless shower need not condemn a bather to exposure in the name of freedom. Combine solid corner walls with attached or free-standing tile or see-through partitions that preserve the free experience of the shower. Glass brick, etched glass and glossy-surfaced tile are good materials for screening between the shower and the rest of the bathroom. Overlapped curved partitions, a sloping wall and a free-standing screen are all dramatic and effective ways to give a bather some privacy while preserving the openness of the shower. A door can make a shower seem cramped, but it also keeps bathers warmer than the open space of a doorless shower. Overlapping walls at the shower entry creates a baffle-effect to prevent drafts. Three solid walls restrict cold air to a single side of the shower. A free-standing partition centered on open space reduces air movement, keeping the shower area temperature more stable. An alternative is to create a warming area with infrared lighting next to the shower area. As with all electric bathroom fixtures, be careful to position warming lights away from possible water spray. Even though mopping up after a shower can make surfaces dry, doorless showers let more water vapor diffuse into the room's air than is likely with a conventional shower stall. Two strategies can keep your bathroom from showing the effects of additional water vapor. Plan to use waterproof materials, such as tile or natural stones, throughout the entire bathroom. Painted walls and wood trim are more vulnerable to water damage than harder-surface materials. Install a vent system designed to clear vapor from a room with dimensions equal to or larger than your bathroom. A vent system designed for a smaller space leaves you with the odors and organisms associated with a damp environment such as mold and mildew.